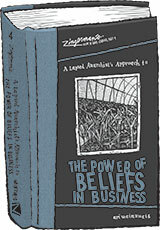 Zingerman's Guide to Good Leading Part 4: A Lapsed Anarchist's Guide to The Power of Beliefs for sale. Buy online at Zingerman's Mail Order. Gourmet Gifts. Food Gifts. The fourth book in the phenomenal series by Zingerman's Co-Founder, Ari Weinzweig. Ari’s new book is the culmination of a lifetime of learning and thirty-four years in business, the last three of which have been spent intensively studying, reflecting on, and writing about the critical role of beliefs in the businesses and organizations of which we’re a part. Many of us throughout the Zingerman's Community of Businesses live these lessons and benefit from the wisdom of its author, every day. Now it's time to share that knowledge with business runners of all sizes, entrepreneurs, students of business and fans of Zingerman's.